(From left) Ms Tania Lee, Marketing Manager, Campbell Soup Southeast Asia Sdn Bhd with Chef Fikree presenting the winning prize to Pn Mariah and husband, En Shaharudin. Petaling Jaya, July 3, 2018 – Kimball invited Celebrity Chef Fikree and paid a visit to the home of the grand prize winners for their latest Raya contest bearing scrumptious feast using recipes from their campaign ‘Kimball Mudah dan Lazat, Hati Terpikat’. 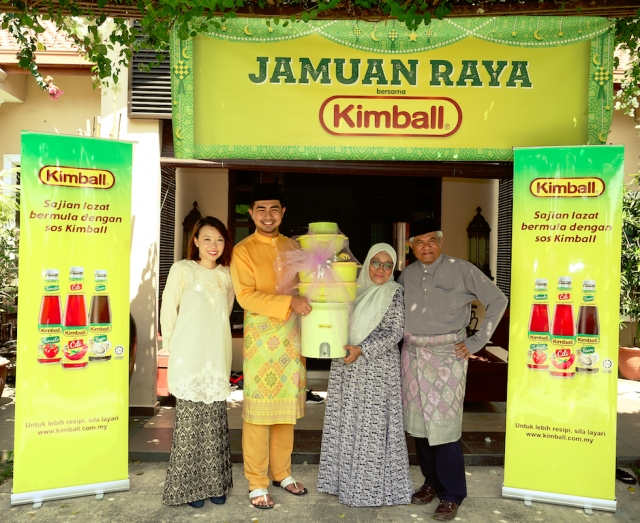 Kimball organized a “Win A Raya Feast with Celebrity Chef Fikree” to reach out and reward loyal Kimball consumers for their continuous support towards Kimball, especially during this festive season. This also gives the winners a chance to invite their family and friends over to enjoy a Kimball Raya feast without the stress of organizing one. The two loyal Kimball consumers who won themselves a memorable Kimball feast with Celebrity Chef Fikree were Pn. Mariah Binti Idris from Selangor and En Haniff Baharom from Pahang. Apart from winning a festive Kimball Raya Feast with Chef Fikree, the two grand prize winners for this contest also won themselves a Tupperware hamper worth RM1,000 each! Mother of 4 children, Pn Mariah was excited to have had Chef Fikree together with Kimball over as she is a big fan of the chef and a long-time user of Kimball products. “We were overjoyed to have Chef Fikree and Kimball over. I have gotten so many useful cooking tips! 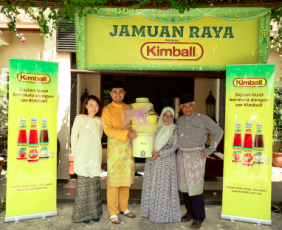 It was a fun day filled with the joy of Raya spirit as we were all brought together by the delicious food prepared by Kimball, especially the Kuah Kacang Daging Istimewa Kimball that were using Kimball Oyster Flavoured Sauce and Kimball Chilli Sauce. But more than that, I got to spend more time with my family and closest friends instead of spending long hours in the kitchen. My whole family is still starstruck with Chef Fikree as we follow him closely from cooking competitions to cooking program. Thank you for bringing laughter and happiness into our home,” said Pn. Mariah. According to En Haniff, he joined in the Kimball Raya contest with the hopes that he will nab one of the two grand prizes for his mother to make their family’s Raya celebration more special this year, as his mother is a big fan of Chef Fikree. “This Raya is very special to me and my family as we have a chance to celebrate this special day with Chef Fikree through Kimball. My whole family is delighted beyond words, especially my mother who loves trying out Kimball’s recipes and constantly follows Chef Fikree’s culinary tips. Thank you so much to Kimball for giving us such a memorable Raya,” En Haniff mentioned. Chef Fikree surely understands that it is not easy to plan for everything and cook a delectable selection of scrumptious feast for Raya open house. He exchanged experiences with the family on how to be better prepared for an open house. “Expectations on preparing a festive spread can be very high, and many mothers especially feel that they must outdo themselves in serving up the best, tastiest and most elaborate meals to impress relatives and guests. My advice to them is to work with tested and proven, yet quick and convenient recipes like those developed by Kimball, and let the taste speak for itself. To make the meal more memorable, spend some time on setting the table and creating a festive atmosphere as well,” mentioned Chef Fikree. 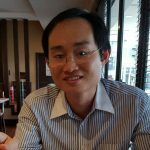 According to Ms Tania Lee, Marketing Manager, Campbell Soup Southeast Asia Sdn Bhd, Kimball in on a constant lookout to reward and create engagement with their loyal consumers. “We are very excited to be bring the Kimball feast to the homes of loyal Kimball consumers this year. It is wonderful to know these families on a much more personal level. We are also thrilled to be able to create a unique and memorable experience with Chef Fikree for these winners while easing their burden of organizing a Raya open house,” said Ms Lee. “We hope that many Malaysian will find the recipes from our campaign ‘Kimball Mudah dan Lazat, Hati Terpikat’ useful, and may they will be successful in recreating the recipes at home. These easy and delicious recipes showcase how versatile Kimball products are and are perfect for any festive occasions,” mentioned Ms Lee in closing. With a heritage of over 40 years, Kimball is a Malaysian food brand that has a wide range of products such as Sauces (Chilli, Tomato, Oyster, Black Pepper, BBQ), Dressing (Mayonnaise), Dry Pasta and others to create flavorsome possibilities for less. Kimball encourages Malaysians to use Kimball products in their meal preparation to make the dishes tastier at affordable cost.